Our company has specialized in the sphere of fabricating a wide range of Memmert Hot Air Oven that is sturdy in construction & durable. We used high-grade raw materials that is procured from the renowned vendors of the country for the MFG. process for ensuring high efficiency of the memmert incubators. Available in different sizes, we can also customize this incubator as per the requirement of Clients. 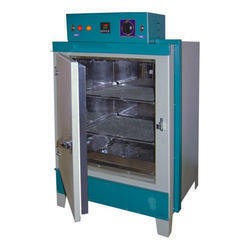 Laboratory Hot Air Oven and is perfect for R & D laboratories, educational institutes, and pharmaceutical industry. 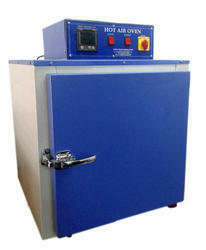 The hot air oven is created from double-walled construction that is designed to hold in heat and reduce energy output. The outer case of this unit is made of metal with pre-treated with primers and painted with stove enamel or powder coated, delivering rust proof and long lasting performance. The inner case is made of high-quality stainless steel of S.S.304 grade. The stainless steel inner chamber is corrosion resistant, durable and easy to clean. The gap between the walls is filled with glass wool ensuring maximum thermal efficiency. This unit comes with one or three shelves depending on the inner size. A built-in fan has also been used for even distribution of heat inside the chamber. This unit also equipped with a LED display, enabling users to monitor the chamber temperature at any given point. For large-sized models, we also offer rust proof steel mount. Our standard hot air ovens are equipped with several advanced features; however, we also customize these ovens as per specific requirements. Customized Hot Air Oven also available Single channel Data Logger with printing arrangement RS 485 for PC communication with Software Meta-Logger.